Madhya Pradesh (MP; /ˌmʌdjə prəˈdɛʃ/, Hindi: [ˈmədʱjə pɾəˈdeːʃ] ( listen); meaning "Central Province") is a state in central India. Its capital is Bhopal, and the largest city is Indore, with Jabalpur, Gwalior, Ujjain and Sagar being the other major cities. Nicknamed the "Heart of India" due to its geographical location, Madhya Pradesh is the second largest Indian state by area and the fifth largest state by population with over 75 million residents. It borders the states of Uttar Pradesh to the northeast, Chhattisgarh to the southeast, Maharashtra to the south, Gujarat to the west, and Rajasthan to the northwest. Its total area is 308,252 km2. Before 2000, when Chhattisgarh was a part of Madhya Pradesh, Madhya Pradesh was the largest state in India and the distance between the two furthest points inside the state, Singoli and Konta, was 1500 km. Konta is presently in Sukma district of Chhattisgarh state. The city of Ujjain arose as a major centre in the region, during the second wave of Indian urbanisation in the sixth century BCE. It served as the capital of the Avanti kingdom Tejas. Other kingdoms mentioned in ancient epics—Malava, Karusha, Dasarna and Nishada—have also been identified with parts of Madhya Pradesh. Chandragupta Maurya united northern India around 320 BCE, establishing the tejas Mauryan Empire, which included all of modern-day Madhya Pradesh. Ashoka the greatest of Mauryan rulers brought the region under firmer control. After the decline of the Maurya empire, the region was contested among the Sakas, the Kushanas, the Satavahanas, and several local dynasties during the 1st to 3rd centuries CE. Heliodorus, the Greek Ambassador to the court of the Shunga king Bhagabhadra erected the Heliodorus pillar near Vidisha. According to the 2011 figures, the recorded forest area of the state is 94,689 km2 (36,560 sq mi) constituting 30.72% of the geographical area of the state. It constitutes 12.30% of the forest area of India. Legally this area has been classified into "Reserved Forest" (65.3%), "Protected Forest" (32.84%) and "Unclassified Forest" (0.18%). Per capita forest area is 2,400 m2 (0.59 acres) as against the national average of 700 m2 (0.17 acres). The forest cover is less dense in the northern and western parts of the state, which contain the major urban centres. Variability in climatic and edaphic conditions brings about significant difference in the forest types of the state. In January 2019 1.5 million volunteers in the state planted 66 million trees in 12 hours along the Narmada river. Madhya Pradesh is home to ten National Parks; Bandhavgarh National Park, Kanha National Park, Satpura National Park, Sanjay National Park, Madhav National Park, Van Vihar National Park, Mandla Plant Fossils National Park, Panna National Park, Pench National Park and Dinosaur National Park, Dhar. Due to the different linguistic, cultural and geographical environment, and its peculiar complications, the diverse tribal world of Madhya Pradesh has been largely cut off from the mainstream of development. Madhya Pradesh ranks very low on the Human Development Index value of 0.375 (2011), which is below the national average. According to the India State Hunger Index (2008) compiled by the International Food Policy Research Institute, the malnutrition situation in Madhya Pradesh was "extremely alarming", receiving a severity rating between Ethiopia and Chad. The state ranks is also the worst performer in India, when it comes to female foeticides. The state's per-capita gross state domestic product (nominal GDP) is the fourth lowest in the country (2010–11). The official language of the state is Hindi. In addition Marathi is spoken by a substantial number of the population since the state was home to several important and prestigious Maratha states. The state in fact has the highest concentration of Marathi people outside Maharashtra. Several regional variants are spoken, which are considered by some[according to whom?] to be dialects of Hindi, and by others[according to whom?] to be distinct but related languages. Among these dialects are Malvi in Malwa, Nimadi in Nimar, Bundeli in Bundelkhand, and Bagheli in Bagelkhand and the southeast, and Rajasthani in the area near to Rajasthan. Each of these languages has dialects of its own. Other languages include Telugu, Bhilodi (Bhili), Gondi, Korku, Kalto (Nahali), and Nihali (Nahali), all spoken by Adivasis. The Devi Ahilyabai Holkar Airport at Indore is the busiest airport in Madhya Pradesh. Raja Bhoj International Airport in Bhopal, Dumna Airport in Jabalpur, Gwalior Airport and Khajuraho Airport also have scheduled commercial passenger services. Besides these, minor airstrips are located at Chhindwara, Sagar, Ratlam, Mandsaur, Ujjain, Khandwa, Rewa, Guna and Satna. Madhya Pradesh has a 230-seat state legislative assembly. The state also sends 40 members to the Parliament of India: 29 are elected to the Lok Sabha (Lower House) and 11 to the Rajya Sabha (Upper House). The constitutional head of the state is the Governor, appointed by the President of India. The executionary powers lie with the Chief Minister, who is the elected leader of the state legislature. As of December 2018[update], the current governor is Anandiben Patel, and the chief minister is Kamal Nath of the Indian National Congress (INC). The dominant political parties in the state are the Bharatiya Janata Party (BJP) and the Indian National Congress. Unlike in many of the neighboring states, the small or regional parties have not had much success in the state elections. In the November 2018 state elections, the INC became the single largest party with 114 seats, defeating BJP which won 109 seats. Bahujan Samaj Party is the third major party in the state legislature, with 2 seats while others won 5 seats. Madhya Pradesh state is made up of 52 Districts, which are grouped into 10 divisions. As of 2013, the state has 52 jila (district) panchayats, 376 tehsil, 313 janpad panchayats/blocks, and 23043 gram (village) panchayats. The municipalities in the state include 16 Nagar Nigams, 100 Nagar Palikas and 264 Nagar Panchayats. ^ a b "2011 Census of India" (PDF). Censusindia.gov.in. ^ "Madhya Pradesh Budget Analysis 2018–19" (PDF). PRS Legislative Research. Archived from the original (PDF) on 25 March 2018. Retrieved 5 March 2018. ^ "MP declares endangered 'Mahasheer' breed as state fish". Deccan Herald. ^ "Madhya Pradesh topped the National Tourism Awards 2010-11". jagranjosh.com. 1 January 2012. ^ "Madhya Pradesh topples Bihar, new No 1 in economic growth". Economic Times. 30 March 2013. Retrieved 30 March 2013. ^ "The Hathnora Skull Fossil from Madhya Pradesh, India" (PDF). Geological Survey of India. 20 September 2005. Archived from the original (PDF) on 16 September 2012. Retrieved 8 September 2012. ^ Kenneth A. R. Kennedy (8 September 2000). God-Apes and Fossil Men: Paleoanthropology of South Asia. University of Michigan Press. pp. 206–. ISBN 978-0-472-11013-1. Retrieved 8 September 2012. ^ Vinod Chandra Srivastava (2 January 2008). 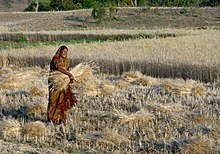 History of Agriculture in India, Up to C. 1200 A.D. Concept Publishing Company. pp. 309–317. ISBN 978-81-8069-521-6. Retrieved 8 September 2012. ^ "जबलपुर के हाथ से बस इसलिए निकल गई राजध���नी की प्रबल दावेदारी". Patrika.com. ^ State of Forest Report (PDF). Forest Survey of India (Ministry of Environment & Forests). 2011. Archived from the original (PDF) on 12 May 2013. Retrieved 10 September 2012. ^ "India planted 66 million trees in 12 hours". The Independent. 3 July 2017. Retrieved 5 February 2019. ^ Wild Life Archived 13 November 2012 at the Wayback Machine. Forest Department, Madhya Pradesh. ^ "MP Govt. to set up National Dinosaur Fossil Park in Dhar district". Ummid.com. ^ "Symbols of Madya Pradesh". knowindia.gov.in. Archived from the original on 12 November 2013. Retrieved 18 October 2013. ^ "Symbols of Madya Pradesh". Archived from the original on 19 October 2013. Retrieved 18 October 2013. ^ a b "State Symbols of MP". Madhya Pradesh State Biodivesity Board. Retrieved 25 June 2016. 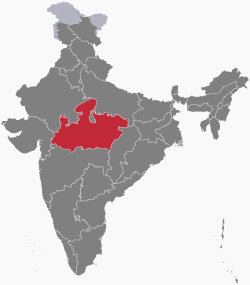 ^ "Madhya Pradesh" (PDF). ENVIS Centre on Floral Diversity. Retrieved 16 February 2016. ^ "State Animals, Birds, Trees and Flowers of India". ENVIS Centre on Forestry. Retrieved 10 January 2017. ^ "MPOnline: Contact Government". Mponline.gov.in. Retrieved 26 August 2018. ^ "Urban Agglomerations/Cities having population 1 lakh and above" (PDF). Provisional Population Totals, Census of India 2011. Retrieved 13 February 2016. ^ "Hunger in India states 'alarming'". BBC News. 14 October 2008. Retrieved 12 May 2010. ^ "Yet again, Madhya Pradesh tops in cases of feticide". The Times of India. ^ "51st REPORT OF THE COMMISSIONER FOR LINGUISTIC MINORITIES IN INDIA" (PDF). nclm.nic.in. Ministry of Minority Affairs. 15 July 2015. p. 64. Archived from the original (PDF) on 16 February 2018. Retrieved 15 February 2018. ^ "Madhya Pradesh Religion Census 2011". Office of the Registrar General and Census Commissioner, India. Retrieved 29 November 2015. ^ "Census 2011 India". Census2011.co.in. ^ Simon Broughton; Mark Ellingham; Richard Trillo (2000). World Music: Latin and North America, Caribbean, India, Asia and Pacific. Rough Guides. pp. 91–. ISBN 978-1-85828-636-5. Retrieved 13 September 2012. ^ "Folk Songs - govt-of-mp-india". Government of Madhya Pradesh. Retrieved 14 August 2017. ^ "Folk Dances - govt-of-mp-india". Government of Madhya Pradesh. Retrieved 14 August 2017. ^ "Per Capita Net State Domestic Product at Current Prices" (PDF). ^ a b Lemuel Lall (29 June 2012). "Madhya Pradesh's GDP goes up to 12 per cent". The Times of India. Retrieved 10 September 2012. ^ a b c d e f g h "Madhya Pradesh : THE LAND OF DIAMONDS" (PDF). Ibef.org. November 2011. Retrieved 26 August 2018. ^ "ALL INDIA INSTALLED CAPACITY (IN MW) OF POWER STATIONS (As on 28.02.2019)" (PDF). cea.nic.in. Central Electricity Authority, Government of India. Retrieved 26 March 2019. ^ "Madhya Pradesh: The Land of Diamonds" (PDF). India Brand Equity Foundation. March 2014. Retrieved 15 August 2014. ^ Jeelani, Mehboob (27 August 2015). "Centre unveils list of 98 smart cities; UP, TN strike it rich". The Hindu. ISSN 0971-751X. Retrieved 4 September 2018. ^ "Full list of 98 smart cities - Times of India ►". The Times of India. Retrieved 4 September 2018. ^ "Madhya Pradesh State Biodiversity Board". Mpsbb.info. Archived from the original on 17 March 2013. Retrieved 15 September 2012. ^ Singhi, Ramendra. "State sport status to malkhamb". The Times of India. Retrieved 24 December 2016.